Brushing and flossing your teeth every day, while important, is only part of a successful oral care regiment. 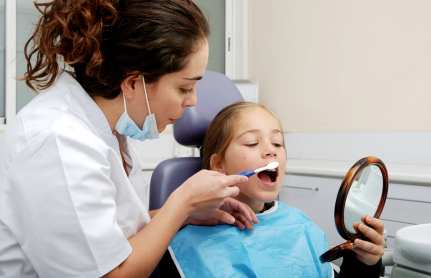 Visiting us every 6 months for a dental cleaning and checkup will help ensure a healthy mouth. Our dentists and dental hygienists will use dental tools to perform painless procedures that remove plaque, tartar, and bacteria that can build up on your teeth that don’t always get cleaned by brushing and flossing alone. Combining regular brushing and flossing with regular visits to us leads to not only a more confident smile, but is a great defense against tooth decay, tooth loss, and gum disease. Professional teeth cleaning are a procedure in which your dentist and dental hygienists use a variety of dental tools to help deep clean below and around your gums and the surface of your teeth. We first use an ultrasonic cleaner and a gentle water jet to loosen and remove tartar and plaque from and around your teeth and gums. We use tools to gently scrape additional plaque and tartar off your teeth. We also floss your teeth to deep clean and stimulate your gums. Finally, we polish your teeth with a soft instrument and a gritty toothpaste-like material. Depending on your situation, we might also provide a fluoride treatment to strengthen your teeth, too. Discomfort is minimal, if at all during any of these procedures.